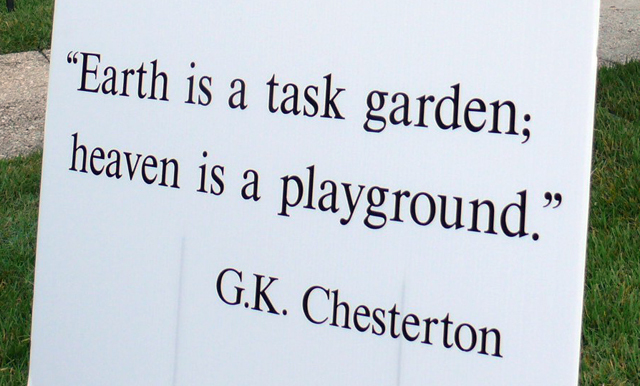 There's a false notion upheld in some schools that "play" happens outside and "learning" happens inside. Yet as many teachers already know (see our Teacher Appreciation Week series), not only should play be an integral part of the classroom experience, but the outdoors is also rife with learning opportunities. The secret is to integrate play into your existing curriculum and "kick the walls out of our classroom." These ideas require minimal preparation to successfully combine play and learning, meeting both our children's need to play AND the increasing demands on our instructional time. Make your science objectives come to life by taking a nature walk and letting the world be your students’ learning laboratory. On the walk, students bring a class-made clipboard with paper for journaling, keeping notes, and drawing. An outdoor clipboard can be made from cardboard scraps with the addition of two clothespins and some paper scraps. After reading our class texts, The History of Children’s Play by Joe L. Frost (2010) and Last Child in the Woods by Richard Louv (2008), graduate student Renee Garvens took her own children on a scavenger hunt to a nearby river. The resulting video of the experience is a perfect example of how play and learning go hand-in-hand. Planting a small garden is another way to connect the indoor curriculum to the outdoors. 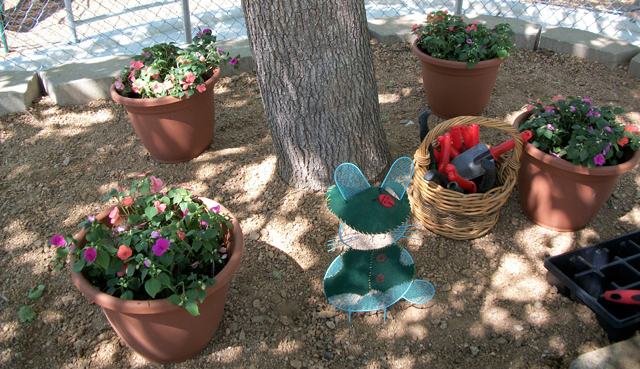 Here, children planted containers of flowers and added a “Peter Rabbit’ wire sculpture dressed for the occasion after reading Peter Rabbit by Beatrix Potter. Many children’s literature titles connect to the outdoors and gardening. A walk is also an easy way to connect vocabulary and play. Ask your students to devise different ways to walk like animals and to draw and describe their results in their journals. Or, look for nouns and adjectives in the outdoors. Resulting adjective-noun pairs might include "bright sun," "gray sky," "rough bark," "soft petals," "beautiful green grass," or "fluffy clouds." Sample specimens can be taped to a sheet of paper as well. While on their nature walk, children can be asked to find five different types of leaves. The leaves can be traced repeatedly on paper, overlapping to form a collage, and the paper then becomes a cover for a math task. Students can also collect natural specimens of leaves, pebbles, bark, and grass, mount them on poster board, count each set of objects, and write out the numbers next to the correct item. Want more ideas for playful learning activities? Register now to participate in a free online discussion and workshop with Mary Ruth Moore and KaBOOM! on Tuesday, May 17, at 2 p.m. EST.